Shown with (A) 5" mold-on rubber wheels. Casters are bolted to steel channel cross members beneath the deck. 1" tubular steel frame. Varnished deck with fixed pipe pockets and removable handle. Two swivel, two rigid casters. 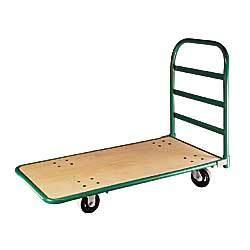 SPECIFY CASTERS: A - 5" mold-on rubber (MR), B - 8" mold-on rubber (MR), C - 8" full pneumatic wheels (FP). IN STOCK. 5" mold-on rubber, 1,400-lb. cap. 8" full pneumatic wheels, 1,200-lb. cap.